RoP : On 8 August 2016, terrorists attacked the Government Hospital of Quetta in Pakistan with a suicide bombing and shooting. They killed more than 70 people, mainly lawyers, and injured more than 130 others. 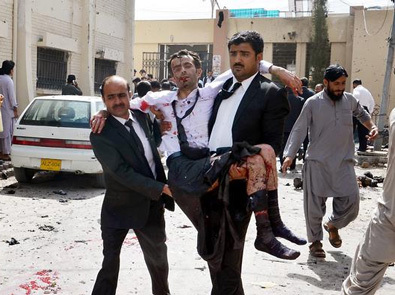 The fatalities were mainly advocates (lawyers) who had assembled at the hospital where the body of Advocate Bilal Anwar Kasi, the president of Balochistan Bar Association, was brought after he was shot dead by an unknown gunman. Responsibility for the attack has been claimed by various Islamist groups like Jamaat-ul-Ahrar and the Islamic State. Between and 94 people were killed and over 120 injured. 54 of those killed were lawyers. On 6 December 2016, the mastermind of the attack, Jehangir Badini, was killed in Pishin during an operation by security forces.